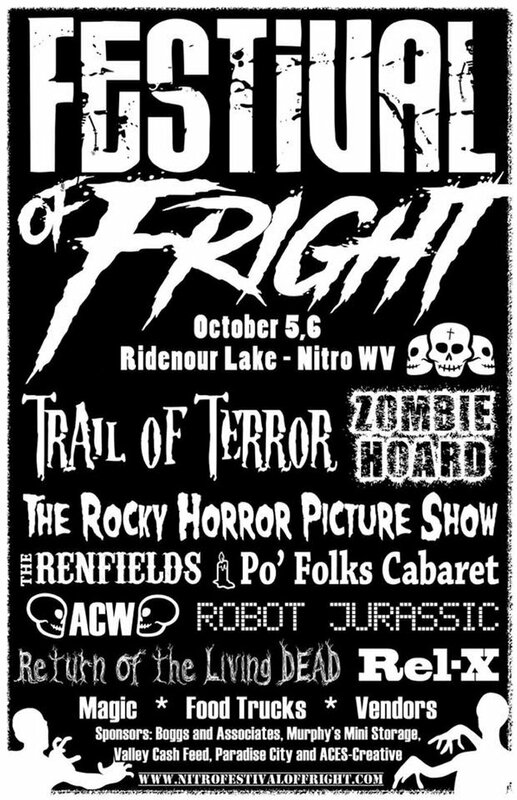 This weekend Halloween season kicks off in earnest in Nitro with the annual Festival of Fright. 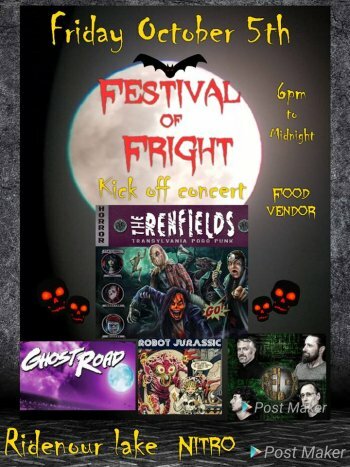 The festivities begin Friday night with a Kick Off concert at Ridenour Lake featuring Ghost Road (7 PM), Robot Jurassic (9 PM) and The Renfields (10:30 PM). That line-up is subject to change, and REL-X may be worked in later in the show. That should get you in the mood for Saturday, when the mayhem begins at noon, with Pumpkin Carving, a Zombie Shoot and Pumpkin Races. At 1 PM ACW Wrestling will present a Meet and Greet, and shuttle service (because of limited parking at Ridenour Lake) begins. At 2 PM ACW wrestling will present two hours of the finest professional wrestling in the Mountain State. At 4 PM The Trail of Terror begins. 5 PM sees the start of the Po’ Folks Cabaret, and 6 PM markes the end of the Pumpkin Carving, Zombie Shoot and Pumpkin Races. Starting at 8 PM Ridenour Lake becomes a Drive-in Theater, with It’s The Great Pumpkin Charlie Brown, followed by Goosebumps. At 10:30 PM the classic Return of the Living Dead fills the screen with R-rated zombie antics, and at midnight everyone will do the Time Warp as the event ends with The Rocky Horror Picture Show. Admission is free, but bring money for the vendors and food trucks. A ghoulishly great time is guaranteed for all. Check their Facebook page for more details. During the rest of this week The AIR presents the best examples of our most popular programs. That probably sounds familiar, since we just did this a couple of times recently, but the fact is that deadlines, outside committments travel and various and sundry upcoming PopCult posts have eaten into our radio-making time. Whilst our hard working crew are preoccupied with life this week The AIR brings you more of the best of our programming. The plan is for us to have a line-up of all-new shows next week, including the return of Herman Linte to the host duties of Prognosis. For now, though, this week, in the spirit of SCTV showing the “Indira” episode every other week, The AIR brings you the best of our recent shows. Tuesday, aside from a new hour of Radio Free Charleston, you will be treated to treasures from our archives for Psychedelic Shack and The Swing Shift. Wednesday it’s encores of Curtain Call, Beatles Blast and Life Speaks to Michele Zirkle. Thursday expect a classic edition of Prognosis, and Friday brings you hand-picked examples of the finest episodes of Radio Free Charleston International and Sydney’s Big Electric Cat. You can keep track of the full schedule on the widget-thingy at the bottom of this post. Since October is Halloween month, this and the next three installments of Monday Morning Art will be moody or spooky or something like that. I haven’t done much in the way of genre art since I stopped contributing to ArtMares, so this gets me back into the Halloween groove. 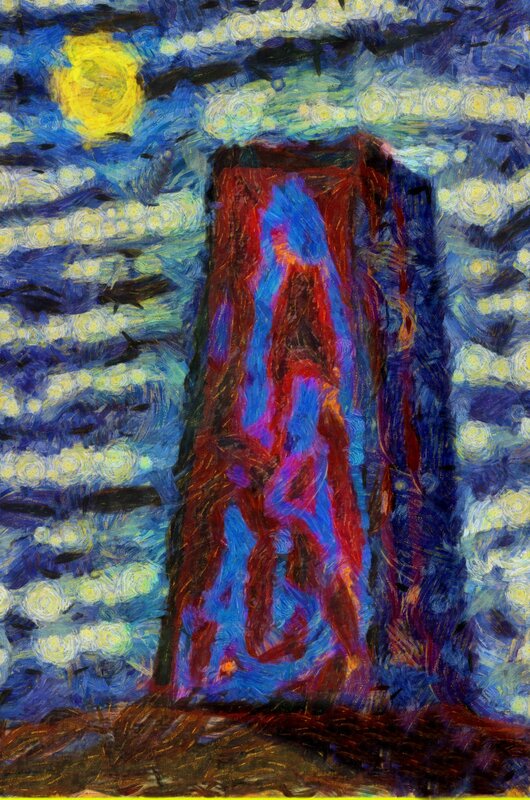 This week’s art is notable because it’s the first piece of digital art that started out as a doodle on my phone. I switched to using a smartphone less than a year ago because for years, with my fingers paralyzed by undiagnosed Myasthenia Gravis, I couldn’t operate a touch screen. With all that sorted out, and with AT&T making my old phone obsolete, I took the plunge and got a mid-level Samsung Galaxy. That phone has a feature called Samsung Notes that allows a person to draw. I just figured out how to export those drawings a couple of days ago, and this particular digital painting started life as a doodle drawn, with my fingertip, late at night while riding the Amtrak Cardinal back from Chicago last Thursday. Once I got it into my computer, I built on the original compostion and painted over it, using some of my custom digital brushes, and made it a bit Van Gooey in the process. I call it Monolith At Midnight (you can imagine spooky music playing when you read that). You can see a bigger version by clicking on the image.